If you have been considering replacing some or all of the windows or doors in your Washington, D.C.-area home or commercial building, why not take a look at designs incorporating the transom windows offered by the home improvement professionals from Shiner Roofing, Siding and Windows? We have served Northern Virginia, Maryland, and the District of Columbia as a licensed, bonded, and insured contractor since 1981. We are a family-owned and -operated company, and we are committed to providing our neighbors in the Capital region the finest home improvement services available. What are transom windows? They are small, usually hinged windows positioned above doors or other windows. A transom, in architecture, is a transverse horizontal structural beam. For purposes of this type of window, the term “transom” refers to the crosspiece that separates the top of the door frame from the bottom of the window above it. Another way to refer to transom windows is transom light, because one of the most attractive features of transom windows is the “skylight” effect you get when natural light streams through. This type of window, when hinged, also provides the opportunity to ventilate a room. 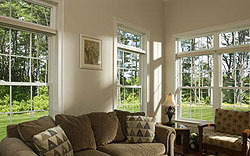 Shiner works with one of the top manufacturers of transom windows in the country, Sunrise. Our window installation experts have been with us for decades, which tells you they have the experience necessary to get your project done exactly as promised, within the anticipated time frame. Contact Shiner today to schedule an on-site evaluation of the window requirements at your home or commercial building in Washington, D.C., McLean, Arlington, VA, Bethesda, MD, or elsewhere in Northern Virginia and Maryland.